When writing the article about Mary Thomson and the Female Industrial School, a great deal of searching was done to try and find a photograph of Mary or some of her pupils but with no success. This photograph was found in the Journal Almanac 1913, a copy of which is in the Local History Section of Dunfermline Library. 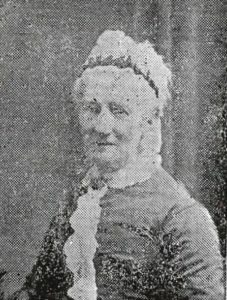 Mary retired in 1881 and this picture was probably taken around that time. It is extremely grainy in appearance but perhaps someone has the original print in their photo album? If so please contact the website.